I have been a bit lack lustre for the past week, as I have been suffering from a dying lower right molar. Been on antibiotics to reduce the inflammation, swelling and pain. Oh what agony it has been. Lack of sleep makes for a grumpy greenie, and so does the cost of getting it fixed. I began Root Canal Therapy today at a specialist in Moonee Ponds. He was good, but he had a bill to match it. I walked out, still in pain, and $700 poorer! The pain is beginning to reduce as the night wears on, and hopefully gone by the morning. I still have 2 more visits to finish off the treatment, and the good doctor quoted me $2500 for treatment and a crown. There goes my water tank savings! Hopefully my blogging mojo will return in the next few days, but please excuse me if I seem to missing in action. 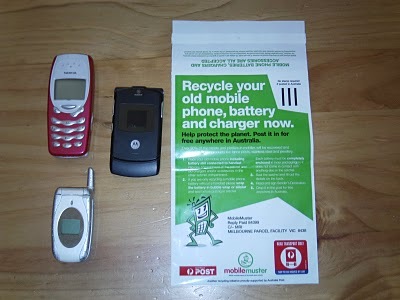 Mobilemuster is the only whole of industry led electronic product recycling program in the world. It is funded voluntarily by handset manufacturers Nokia, Motorola, Samsung Electronics Australia, Sony Ericsson, LG Electornics, Sharp, NEC, Panasonic, i-Mate, battery distributors Force Technology and mobile phone network service providers Telstra, Optus, Vodafone, 3 Mobile, Virgin Mobile and AAPT. 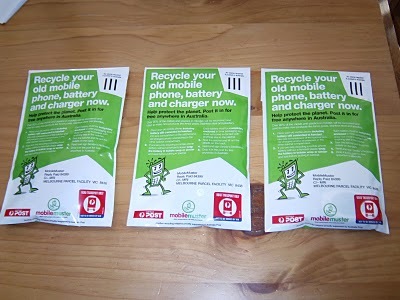 Each pay an advance recycling levy raising 42 cents for every handset they import into Australia. One tonne of mobile phone circuit boards can yield the same amount of precious metals as 110 tonnes of gold ore. 123 tonnes of silver bearing ore and 11 tonnes of copper sulphide ore. See what the materials from old mobiles can be turned into. Click here to find your nearest collection point. Free recycling satchels are now available from participating Australia Post outlets nationwide. Alternatively you can download a reply paid mailing labelling. Convinced? I certainly was, and was guilty of having more than one old handset laying around in drawers. At least I had the common sense not to throw them into landfill. So here are the phones and the recycling satchel that I picked up. You can only put one phone and related accessories into one satchel. After about 2 minutes work, here they all are ready to post tomorrow. I was gob-smacked when I found out that there are 21.2 million subscribers in Australia (June 2009). So that is roughly one phone for every man, woman and child in this country! There were approximately 7.86 million handset imported into the country last year, with only 806,000 were recycled last year, and to make matters worse, the average user upgrades handsets every 18-24 months. There must be so many handsets either thrown into landfill or squirreled away in drawers, forgotten and collecting dust. So round up your old handsets, take them to a collection point, or get a satchel from your participating Australia Post office. Not only will you be avoiding potentially hazardous landfill, but you will be saving resources and preventing habit loss from the mining of the minerals required for the phone components. Win win all around, and it is FREE. It doesn’t get much better than that. Sustainable fun in the sun. What a great day, as it is every year. Unfortunately it was so hot that is was quite uncomfortable in the tents where the talks and workshops were held, but we battled on. If it was a bit cooler, we probably would have stayed longer and checked out a few more presentations. Not to worry, it was all good clean and free fun for all the family. Here are some snippets of our day. Enjoy! If you are in Melbourne it is also on again today. If you have the time, I highly recommend a visit to the Sustainable Living Festival, even if it is just for the food!